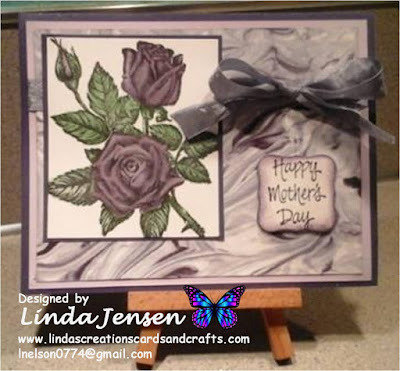 I made this gorgeous card with my Stampin' Up! Butterfly Basics stamp set. It's definitely one of my favorites because it's VERY versatile and I love the images. I'm really happy with how this turned out, the colors are very pretty together and I love butterflies. First cut a 4 1/4" x 11" piece of white card stock and fold it in half for the base, a 4" x 5 1/4" piece of pink for the middle layer and a 3 3/4" x 5" piece of white for the front layer. Then stamp the background with the netting stamp behind the flowers and sentiment only (I know it's hard to see but trust me it's there lol!) in Stampin' Up! Soft Sky ink (I suggest using a stamp positioner unless you're a waaaayyyyy wetter aim than I am lol!). Next stamp the flowers with Stazon Jet Black ink, color them with the light marker in a Stampin' Blendabilities Pink Pirouette marker set then color the centers with the dark marker. Next color the leaves with an aqua painter and Stampin' Up! Old Olive ink. Then stamp the sentiment using Stazon Jet Black ink. 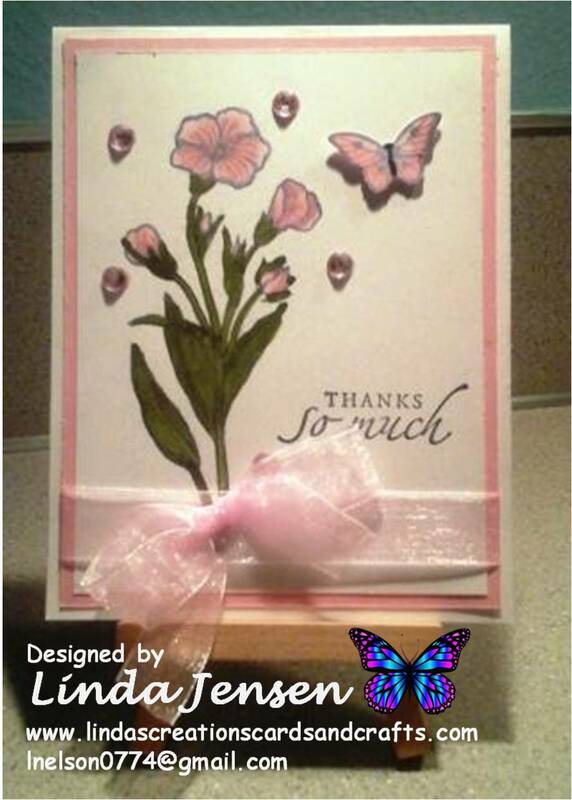 Next stamp the butterfly on a piece of scrap paper with a stamp from a Stampin' Up! Papillion Potpourri set in Jet Black ink. Then color it the same as the flowers, punch it out with the Stampin' Up! Bitty Butterfly punch and attach it to the front layer with a mini pop dot. Next attach the front layer to the middle layer, attach the ribbon around both layers, attach the self-adhesive rhinestones, attach the middle layer to the base and enjoy!